Though these days it's pretty easy to buy fresh pasta in a store, there is something special about making it from scratch at home: the quiet rhythms of kneading the dough, the exertion of rolling it out, the concentration involved in cutting the pasta into strips -- "Short bills and long tagliatelle, say the people of Bologna, knowing whereof they speak, for long bills frighten husbands, while short tagliatelle are proof of the inexperience of the person who made them, and look like leftovers when served," wrote Pellegrino Artusi a century ago. Make a mound with the flour on your work surface and scoop out a well in the middle, to form a "volcano" shape. Pour the eggs into the crater, add the salt, and work the eggs and the flour together with your hands until you have a smooth dough, adding just a few drops of water, if necessary, and no more. Knead the dough for 10-15 minutes, until it is smooth, firm, and quite elastic. Don't skimp on the kneading or the dough will tear while you're rolling it out. Next, separate the dough into 2 pieces. Flour your work surface (marble counter tops are ideal for this, though wood or Formica work as well) and start to roll out the dough, rolling out from the middle, flipping it over occasionally, and flouring it as necessary to keep it from sticking. To keep the sheet of pasta dough from breaking, once it has reached a certain size, roll it up around the rolling pin and then invert the rolling pin; you can, as you are unrolling the sheet, gently stretch it by holding the unrolled part firm and pulling gently away with the rolling pin. Keep on flipping and rolling till you have a sheet that's almost transparent -- as thin as a dime, or thinner, if you can manage it (the pasta will almost double in thickness while cooking). The Emilians, acknowledged masters of homemade pasta, say you should work up a sweat as you're rolling out the sheet. Once you've rolled out the sheet, either use it to make stuffed pasta such as ravioli or tortellini, or for lasagna, or cut it into wide strips. To make long noodles, such as pappardelle, tagliatelle or fettuccine, roll the sheet of dough up into a tube, then slice the tube into rounds of the desired width and gently shake them out to separate the strands; set them to dry on a rack or between two chair backs, supported by a clean kitchen towel or wooden dowel (you often see this in the Italian countryside). Roll out the second portion of dough and cut it as you did the first. Cook the pasta in salted, boiling water. Since it's fresh, it will cook in just 3-5 minutes. Do not let it overcook! Soft wheat flour has much less gluten than the durum wheat used in commercially prepared dry pastas, and will consequently become flabby if it overcooks. These clamp to your work surface, and require that you make the dough. Then you crank it through the rollers until it reaches the proper thinness, and again through the desired cutters to make noodles. 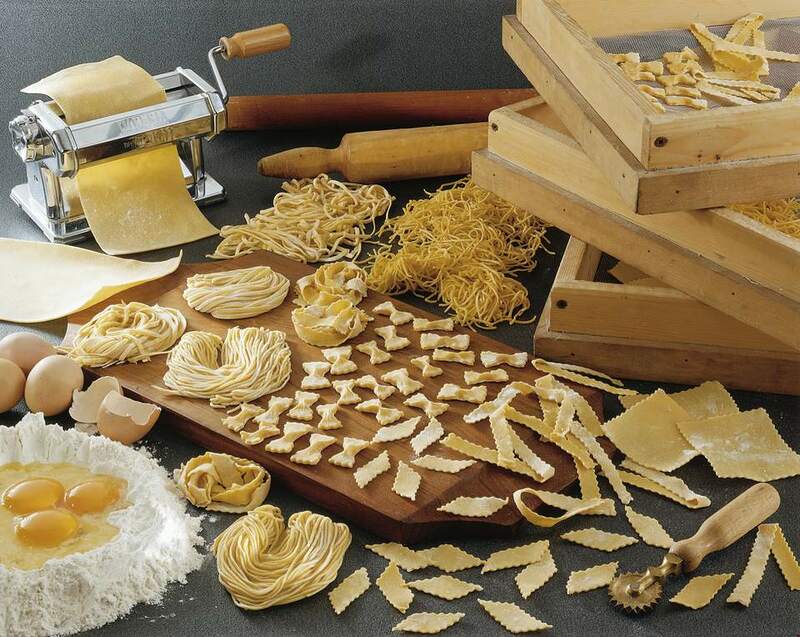 They're limited to making flat types of pasta, such as tagliatelle, taglierini, and lasagne (which can then be used to make filled pastas such as ravioli and the like). With the electric models, you pour the eggs and flour into the machine and it does the rest. Depending on the nozzle you choose, you can also make cylindrical types of pasta such as spaghetti or penne. There are also attachments for making ravioli and other filled pastas. While pasta machines won't work for everything (tortelli di patate, for example, are made with thicker sheets of dough), they're a big help. One of the most fun parts about making fresh pasta at home is that it's easy to add pureed vegetables, nuts, chocolate, fresh herbs or other ingredients to your dough to obtain a wide range of delightful hues. One thing to keep in mind is that the addition of some ingredients will influence the texture of the dough, which will be less elastic and consequently more difficult to roll out. Therefore, you might not succeed in getting the sheet quite as thin as you would a sheet made from just flour and eggs. Since the moisture content of vegetables will vary from batch to batch, the quantity of flour is indicative. If the dough comes out overly moist and sticky, add more flour (you'll learn to judge how much you'll need with experience). Wash the spinach well, shred it coarsely, and heat it in a pot with just the water that sticks to the leaves. Add a pinch of salt and stir it until it is completely wilted (5 minutes), then let it cool and squeeze it well to remove all the moisture you can. Puree the spinach and combine it with the other ingredients when you make the dough. As variations, you can also use wild greens, or nettles (use gloves when you pick and wash them). Peel the carrots, dice them, and simmer them until soft in lightly salted water. Drain them well, puree them, and return them to the pot. Add the tomato paste and heat gently, stirring constantly, until it has become quite firm. Combine the vegetable mixture with the other ingredients when you make the dough. If you want the pasta really red, you can dispense with the carrots and simply cook down a tube of tomato paste, though in this case the resulting pasta will be rather acidic and will require something along the lines of a cream sauce to balance it. Combine all the ingredients, and make pasta as you normally would. Contrary to what you might expect, it's not sweet. It will work quite nicely with rich, wild game-based pasta sauces. You shouldn't need salt, due to the salt content of the Parmigiano. Combine the ingredients and proceed as normal, seasoning the finished pasta with unsalted butter and sage or a light tomato sauce. One warning: because of the cheese, this pasta doesn't keep well. Not carrot this time, but squash: Pick one with orange flesh (pumpkin will work). Peel and dice the squash, discarding seeds and strings, and boil the pieces in lightly salted water for about 30 minutes. Drain the pieces well and puree them; should the paste be too liquid, heat it in a pot, stirring briskly, until it has thickened. Use the paste to make the pasta. These are a surprising delight, and since the strengths of herbs vary from time to time, will never be quite the same from batch to batch. The exact volume of herbs will vary depending upon the herbs you chose and their potency. In any case, wash them well, pat them dry, strip the leaves from the stems, and mince the leaves. Combine the ingredients and make the pasta. The best sauce here will be unsalted butter, and a light dusting of grated Parmigiano. (Note: You can also use whole leaves of a mild herb, for example, parsley, when rolling dough through a pasta machine to embed then within the sheets of pasta. This makes a particularly lovely lasagna or pappardelle. These are slightly unsettling the first time one sees them, but are perfect with cream, fish-based sauces. Combine the ingredients and make the pasta as usual. Chestnut flour works quite well in pasta. The proportion you'll want is 1/3 chestnut flour to 2/3 white flour; figure the usual number of eggs. Another option to make light brown pasta is a 50-50 mixture of whole wheat and regular flours. Steep the porcini for 10 minutes in a small amount of boiling water, then drain them well, reserving the liquid. Blend the porcini. Strain the liquid, which may contain sand, into a pan, add the porcini, and heat, stirring constantly, until the mixture has thickened. Let the mushrooms cool, and combine them with the other ingredients when you make the pasta. This pasta will be delightful with unsalted butter and a dusting of cheese, or a simple cream sauce. Cook the beet if need be, skin it if need be, dice it, blend it, put the paste in a fine muslin bag, and squeeze out as much of the juice as you can. Combine the paste with the remaining ingredients and make the pasta. This pasta tends to crack as it dries, so use it as soon after you've rolled the sheet as possible. Gualtiero Marchesi, Italy's most respected chef, did these on a cooking show a number of years ago, and they are most impressive. Use them to make large ravioli, of the kind that are simple squares whose edges are tamped down around the filling, and serve them simply, with unsalted butter and grated cheese, lest the sauce cover the pattern. He used a hand-operated pasta machine to do the pressing. Make pasta following the standard recipe given on page 1 of this article, and roll it out to the standard thickness. Next, take well washed sprigs of parsley or other leafy herbs and pinch away the stems so only the leaves remain. Cut the pasta into strips about twice as wide as the leaves, brush one side of a strip with a little cold water, and lay down a row of leaves, separating them by about a half an inch. Cover with a second strip and run the sandwich through the pasta machine. The leaves will be visible through the pasta. Continue making strips and running them through the pasta machine until all of the dough is used up. A typical pasta from the Puglia region, shaped like little ears. How to make them, with several sauce suggestions.